Good small business expense tracking practices are vital to the success and sustainability of any small business, especially those that purchase a regular and high volume of business and project supplies. If you lose sight of your expenses, it could spell real trouble for your business, especially at tax time. Neat makes expense management a breeze by offering a variety of ways to capture expenses including mobile receipt scanning, document scanning, email-in and direct upload. All paper-based documents go through our ID2 technology and key information is extracted and made available for expense reporting with the click of a button! 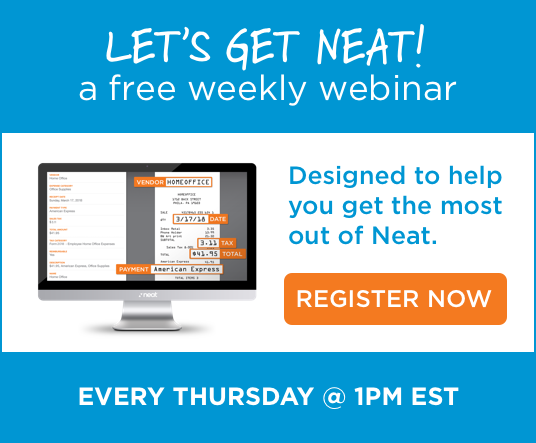 Neat makes small business expense tracking and tax time less stressful and managing your finances a breeze. With our software extracting information directly from your receipts, emails, scans, invoices and virtually any other document Type, Neat eliminates the time-consuming process of entering information by hand. It’ll make you – and your accountant – a whole lot happier. Whether you’re generating a report on office expenses for the quarter or what was spent on gas last month, Neat’s simple and intuitive reporting interface will let you get the results you want with no hassle.